Monday Night Combat has launched today via Valve's Steam service. With it comes not just a port of the Xbox Live Arcade original, but a game that's been carefully tweaked, balanced, and customized for PC gamers. The game has gone through an extensive beta process yielding a really balance and fun experience in both versus and co-op. Along with your standard PC settings like cutomized graphics options and lots of tweaks for the mouse and keyboard - you'll also find yourself enjoying dedicated servers! To celebrate the launch, Uber Entertainment have teamed up with Valve and Penny-Arcade to provide you with some exclusive content. If you purchase the game by February 1st, you'll automatically receive Team Fortress 2 items in Monday Night Combat...and Monday Night Combat items in Team Fortress 2. Does anyone else see the irony here? 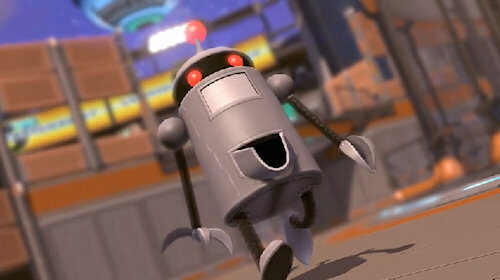 Also - a new robot has been added to the game - Juicebot. The bot by another name on Penny-Arcade will randomly spawn and throw juice upgrades for players to gather. The game has a 4 player co-op mode called Blitz where players team up against endless waves of increasingly difficult robots. To mix things up, there's a strategy element where players must balance cash and upgrades in tower defense like arenas. The PC version even supports the two player split screen co-op that the Xbox Arcade version had. Sorry folks - just found out it actually doesn't support this. Monday Night Combat is out now on Steam for the price of $14.99.